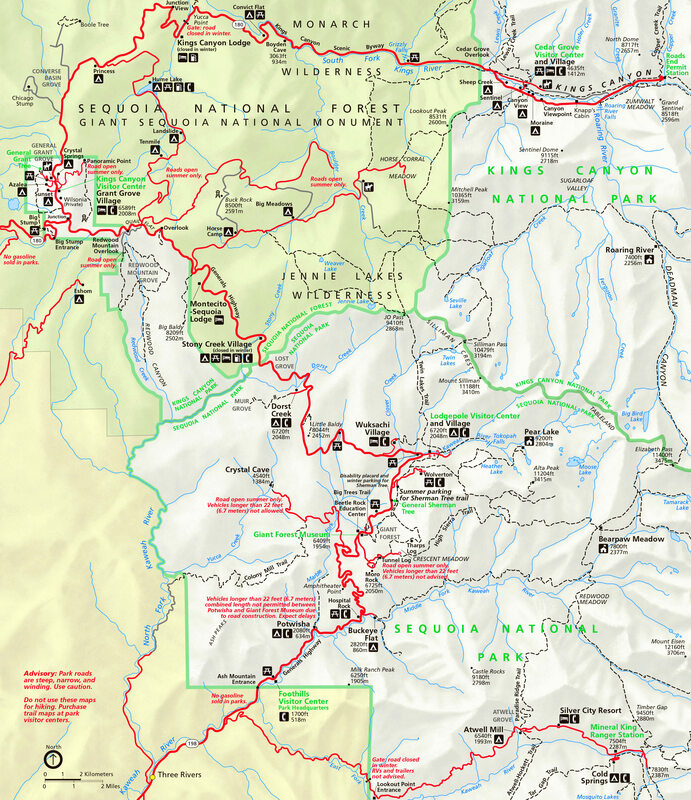 Friday, May 1 through Sunday, May 3, 2015-Lemoore NAS, California: Well, we are about an hour west of the twin National Parks, Sequoia and Kings Canyon. 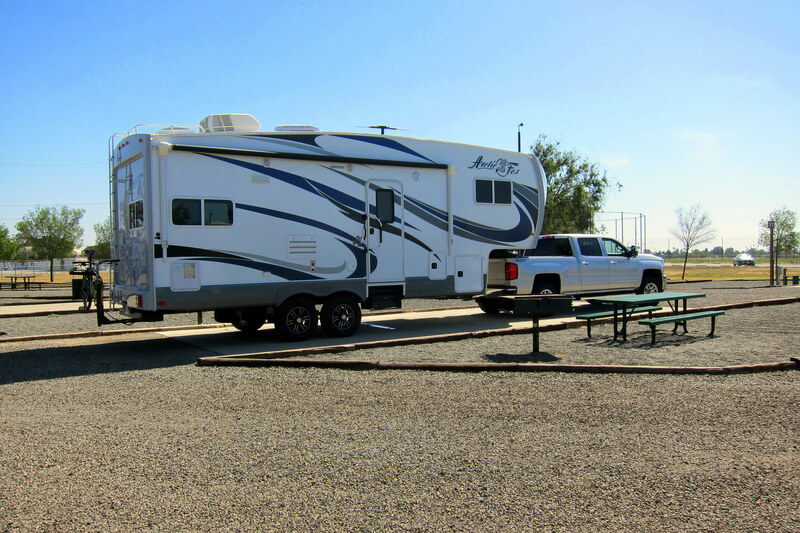 Both parks have campground sites that would fit an RV, but being that it’s a weekend and that some folks actually plan ahead, there was no room for us! So, the Naval Air Station in Lemoore, California is our home base. We registered for four nights which will give us three full days. We plan on spending an entire day at each one of the National Parks with a down day in between. 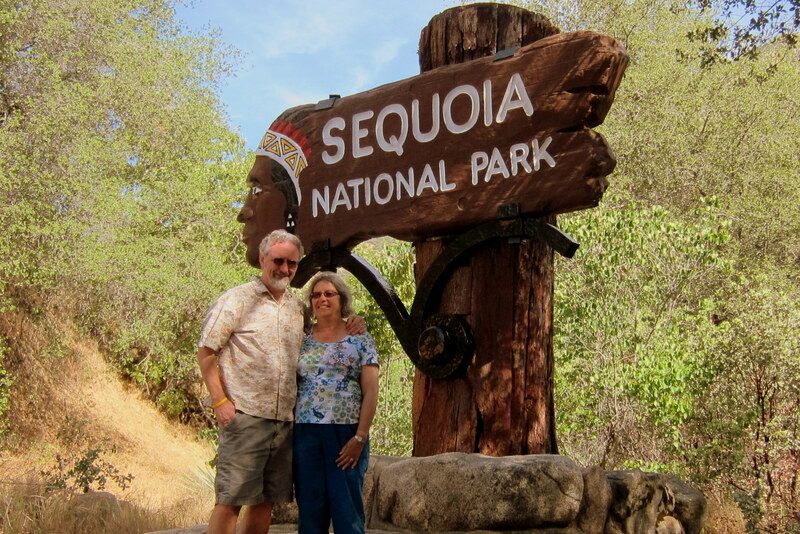 Early on day one, Kit and I headed to Sequoia National Park by way of CA-198. 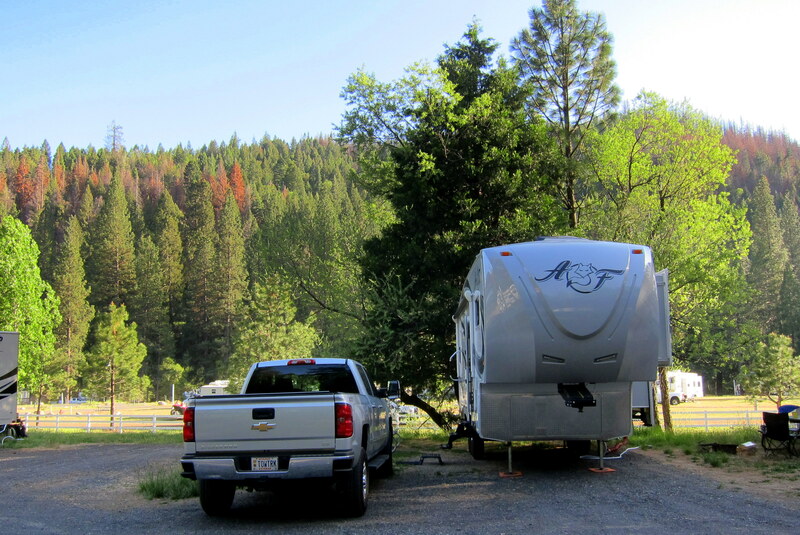 This took us through Three Rivers, California……the self-described Gateway to Sequoia. Kit and I flashed or Senior Passes as we rolled through the gate, then pulled over to snap a photo of the iconic sign. The park’s entrance sign was carved in 1931 by a CCC enrollee using a 10 foot by 4 foot slab off a fallen Sequoia. 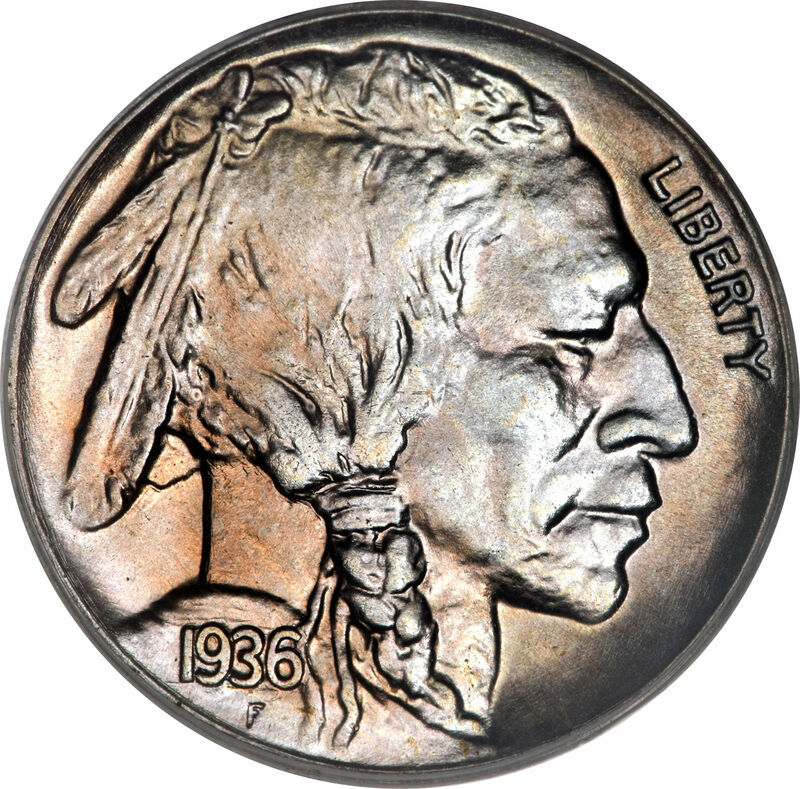 The inspiration and design for the American Indian face was copied from a Buffalo Nickel he had in his pocket at the time. Back underway, we quickly gained altitude as the terrain and vegetation began to change. 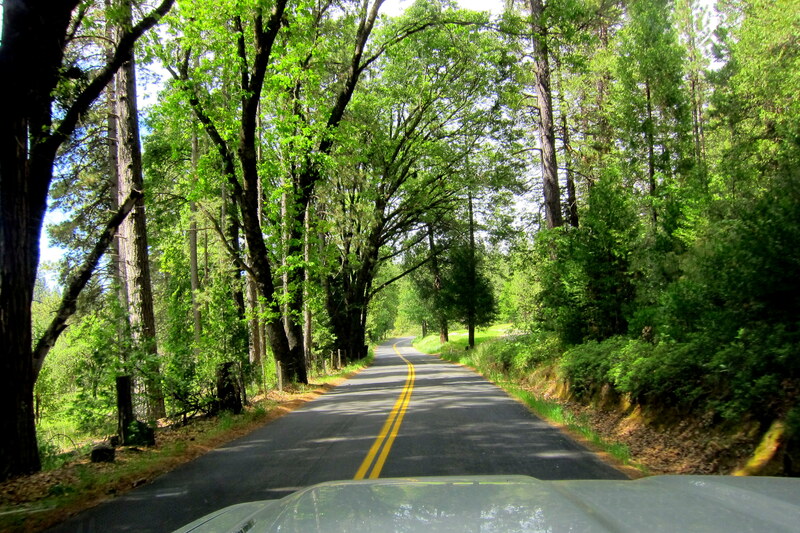 Frequently the park road divided and wound around the huge Sequoia trees. It was during these times that we were glad there was no trailer astern as it was a fairly tight squeeze. On both trees in the above photo there were scars from folks going either too fast or not paying attention. 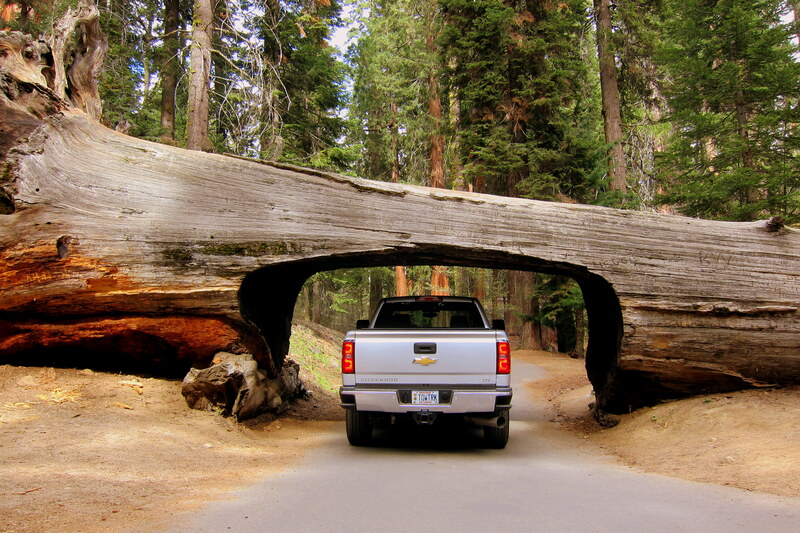 It amazes me that people come to a beautiful park such as Sequoia and then speed through it!?!? In addition, they miss beautiful sights such as this! 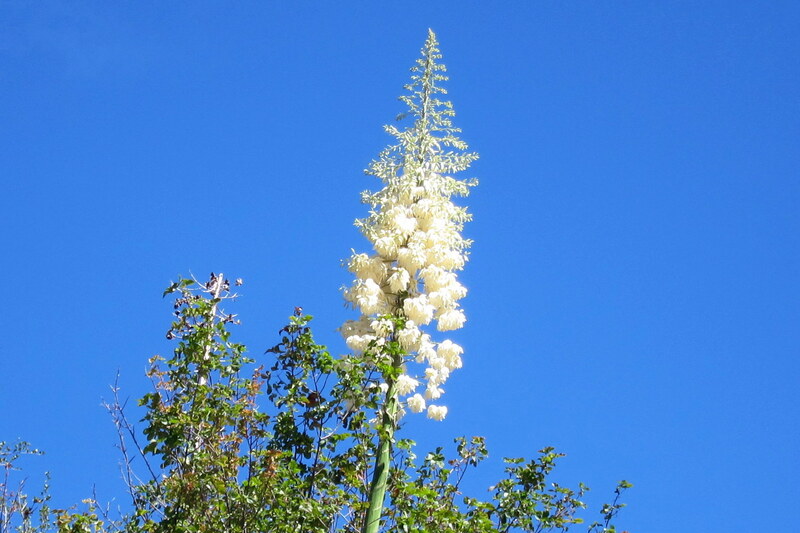 The Yucca were blooming with the whitest flowers we have ever seen…..pretty striking especially against the deep blue sky!! 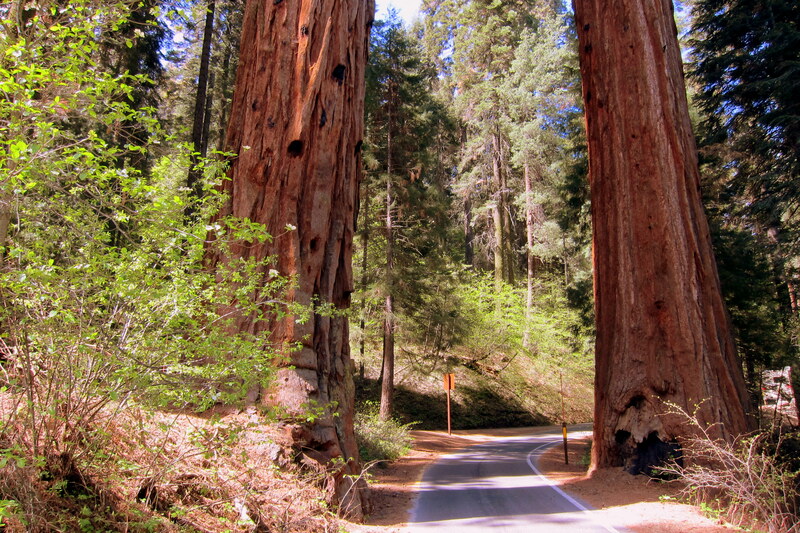 Arriving at the visitor’s center, we discovered that Giant Sequoias are, well…..giant! The example above is described as an “average” Sequoia. 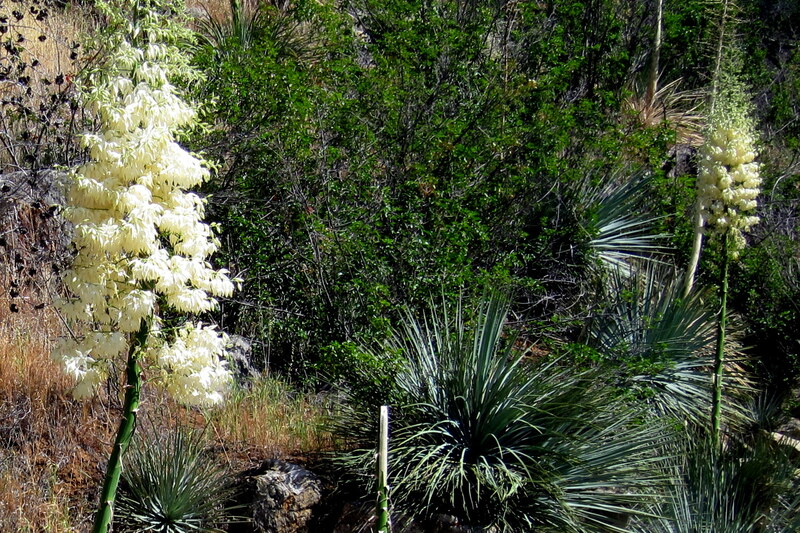 At 275 feet tall and a width of 28 feet, it would dwarf most trees. But in the Sierra’s, there are specimens far larger! 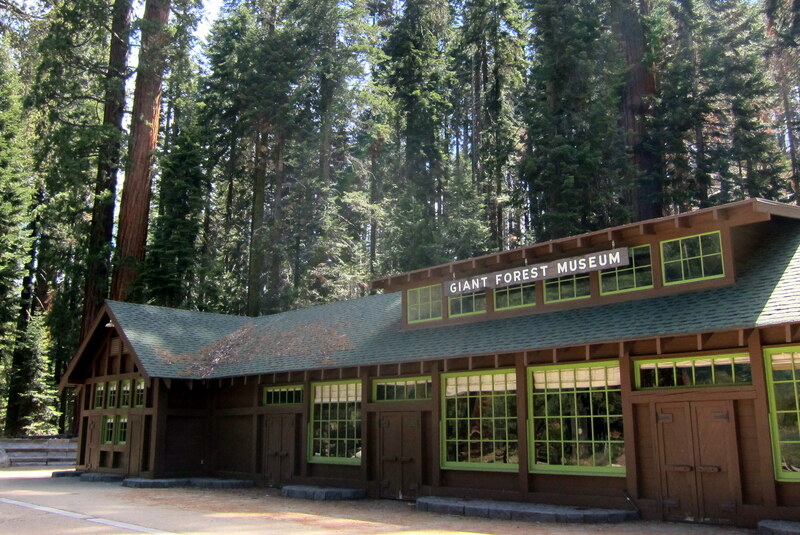 To verify that fact, our next stop was at the Giant Forest Museum and Interpretive Center. 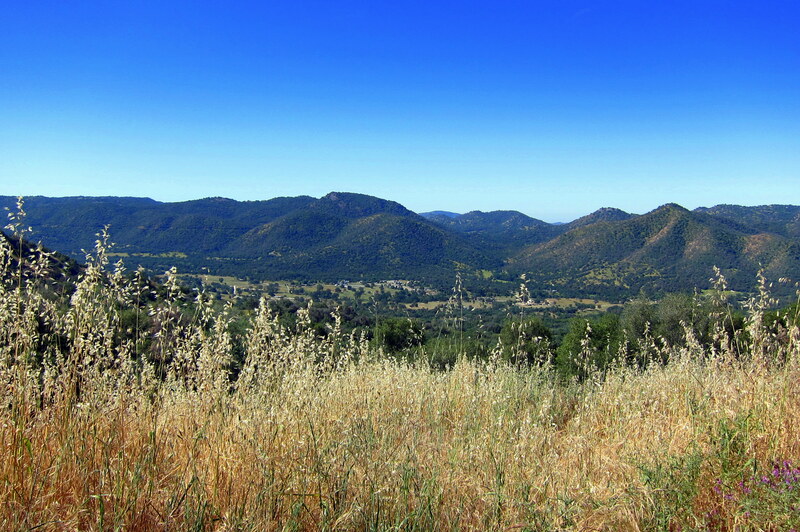 After touring the displays and talking to the rangers, Kit and I decided to walk the nearby Crescent Meadow Trail. 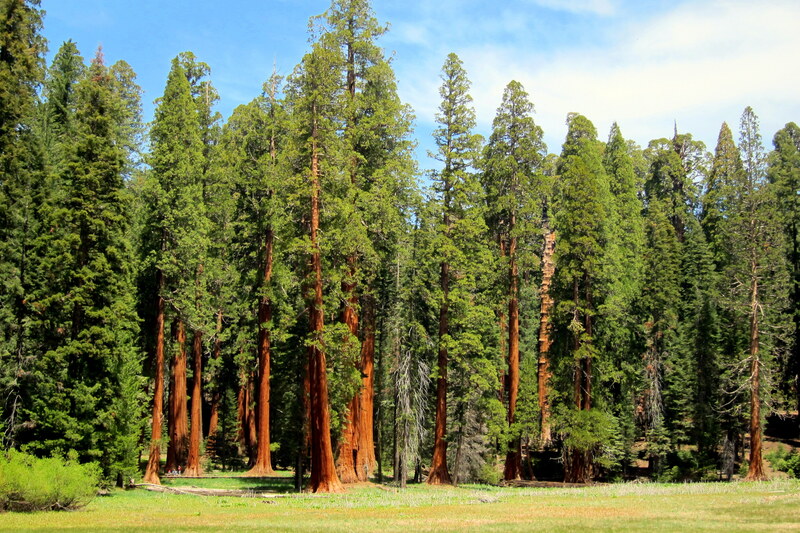 The two mile path circled a meadow that was too wet for Sequoias to grow, however ringing the meadow were hundreds of these magnificent trees. Back in the truck, we next made the tourist pilgrimage to the tunnel tree. This giant fell across the park road in 1937 and the National park suits were debating on what to do. It was then that a young man working for the CCC suggested that a tunnel be cut through the 21 foot diameter monster. Tunnel Tree became wildly popular and a must stop for photo opportunities in the park. Of course had the tree fallen more recently, it would be left to decay in place and the park road would have been relocated……such is the modern environmental ethos! 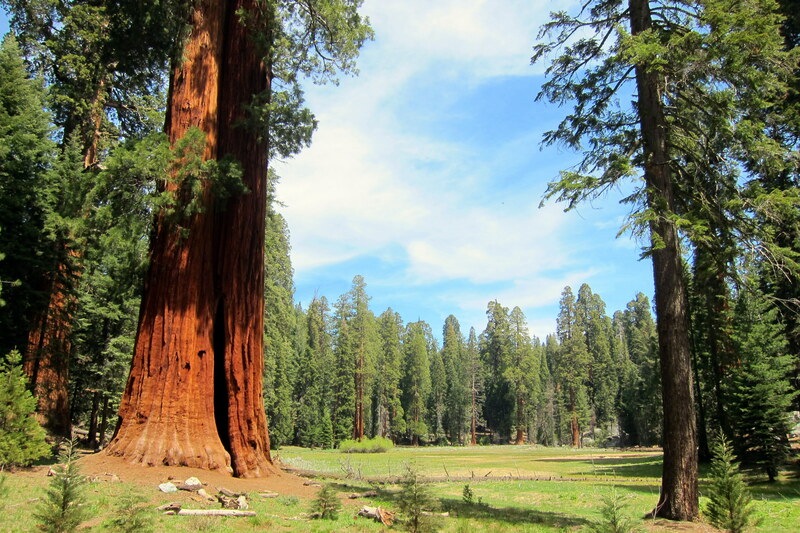 The granddaddy of all Sequoias is the General Sherman…..so big that capturing a photo of the immense tree with a standard camera is near impossible. 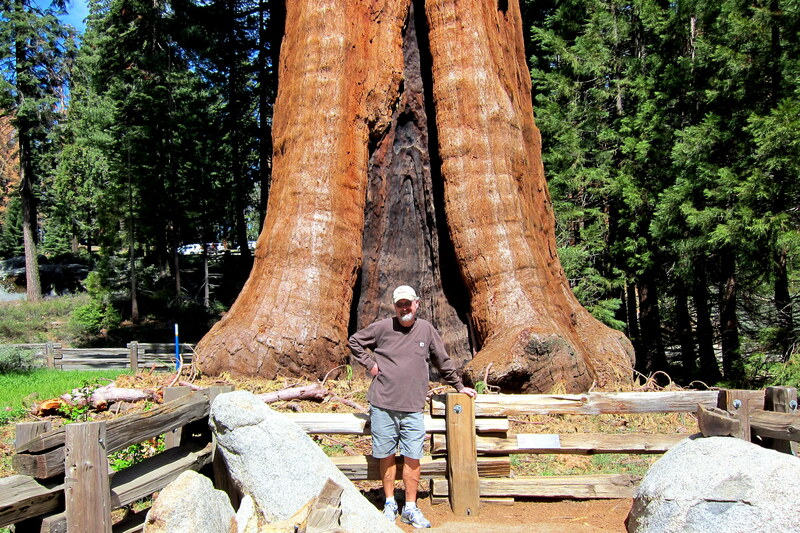 The General Sherman lays claim to the title of the biggest tree on earth! There are taller trees, and wider trees, but none with the volume of wood that The General possesses (snicker). At 52,500 cubic feet this tree is certified as the biggest…..the top has died but it’s still growing in girth! That being said, rumor has it that in the most remote part of this 865,964 acre park is a tree that has not been public acknowledged. 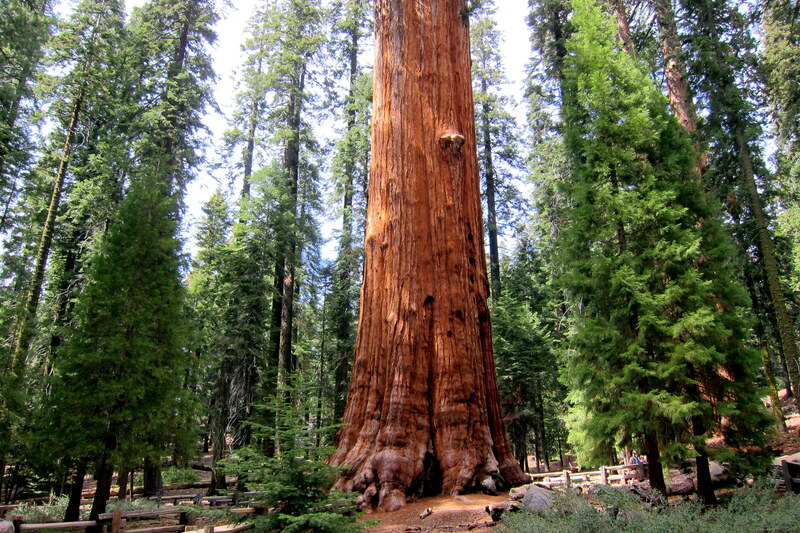 Listed as “Unknown Tree” on some registers, the 311 foot tall giant is 1000 years older than General Sherman! As the story goes, its exact location is a closely guarded secret to protect the tree. As fantastic as these trees are, it’s hard to get a perspective on the Sierra Nevada Mountains unless one climbs above the tree tops. 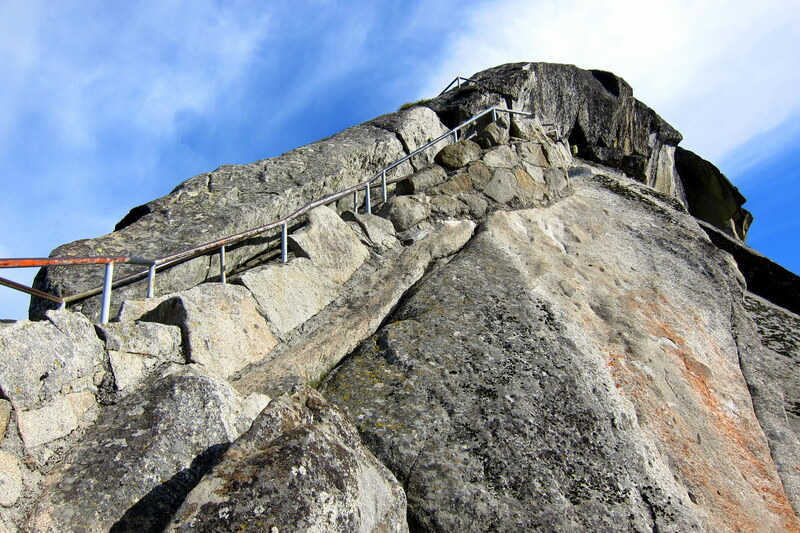 Fortunately, a trail was built by the National Park Service and the CCC during the 1930’s to gain access to the summit of Morro Rock. This path cut into the stone is not for the faint of heart…..which begs the question, what the heck was I doing on it? Well, because of views like this! The peaks of the High Sierras hold onto snow late into the summer, and Mount Whitney the highest peak in the lower 48, has snow every month except August and September! 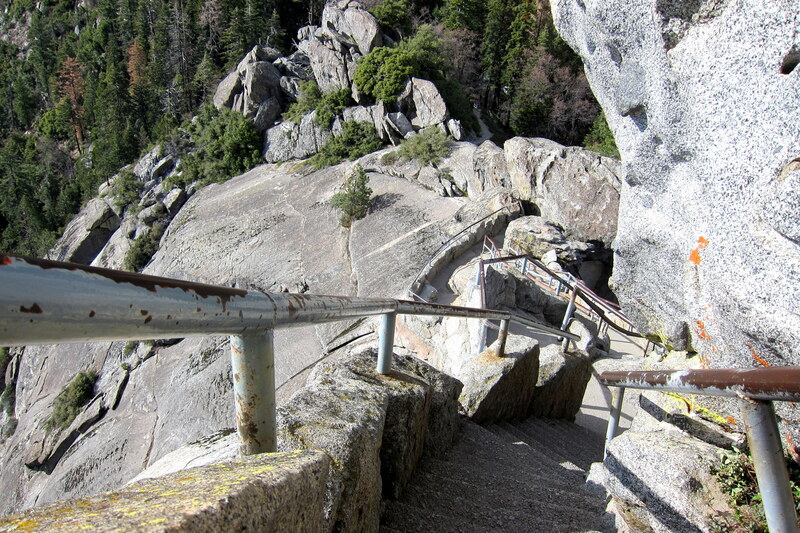 The way back down off the 6,725 foot rock isn’t any easier. But the climb up and back down was the price to pay for enjoying the spectacular views! Note that thin ribbon of blacktop in the photo above…..that’s the park road! It was getting late so Kit and I made our way down from the high country squeezing between many giant Sequoias along the way. As a thank you for indulging my desire to experience this beautiful park, I treated Kit to a nice meal. 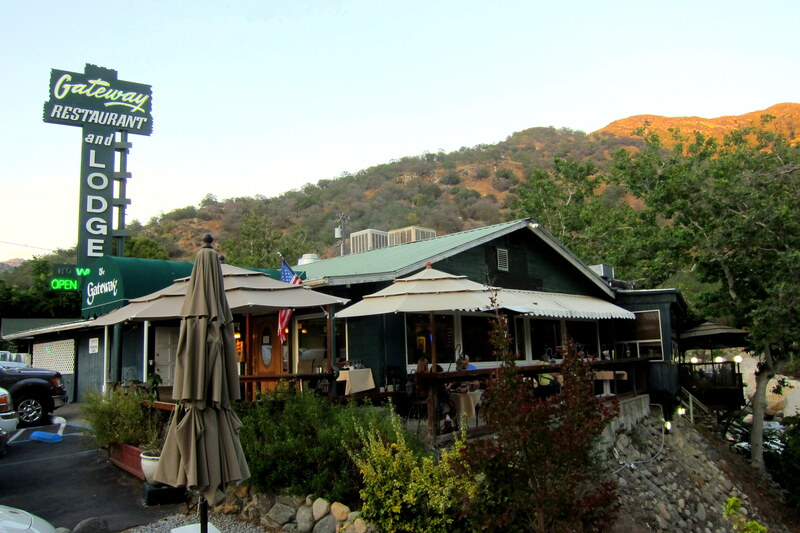 We dined at the Gateway Lodge nestled alongside the Kaweah River just outside the parks southern entrance. 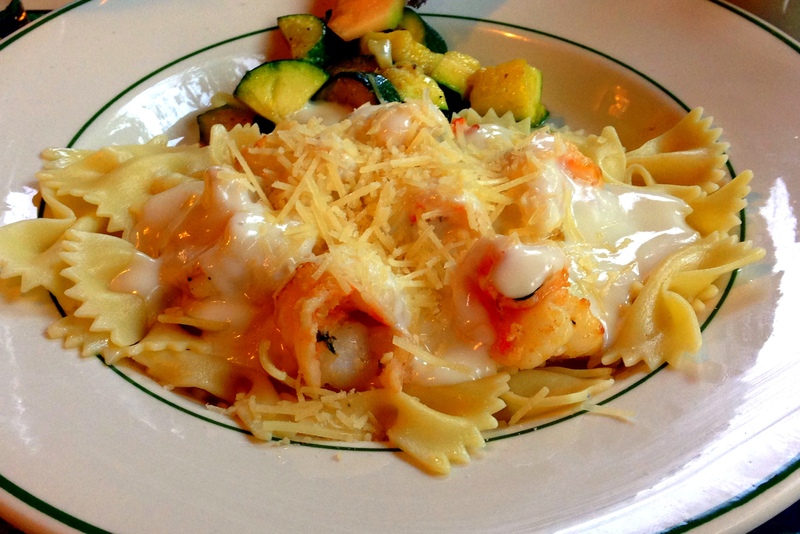 Kit ordered Salmon, and I ordered shrimp pasta. Both were excellent and a great way to finish off a great day at another of Americas great National Park’s! On our second day in the area, Kit and I honored a self-imposed down day. We relaxed around camp, walked about the base, visited the commissary and exchange to re-provision and otherwise goofed off. With some spare time, I worked on this journal and further researched the twin National parks of Sequoia and Kings Canyon on the internet. The two parks were separately run until WWII. Than as an austerity move, and also because many park rangers had gone off to war, the National Park Service combined them into a 1,353 square mile park which is how it remains to this day. Established in 1890 Sequoia National Park, which is actually a species of Redwood, was obviously named after the gigantic tree it hosts. 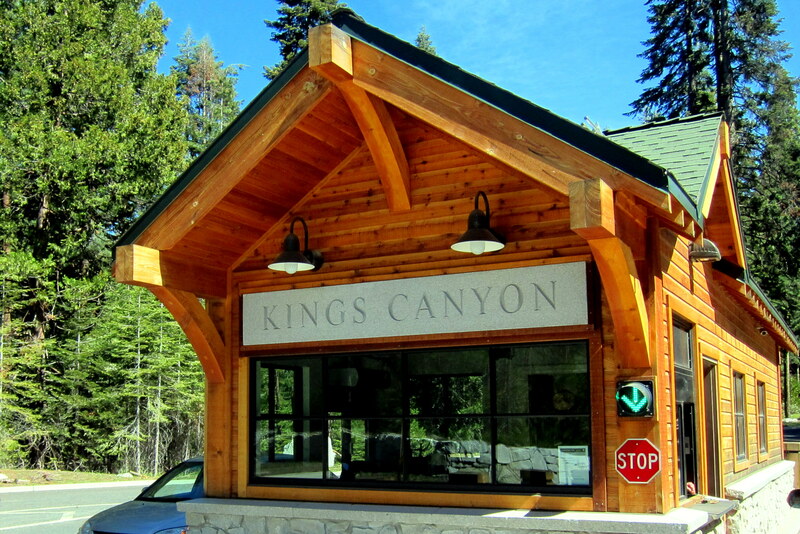 Kings Canyon, established in 1940, derived its name from biblical sources which is why it isn’t spelled with an apostrophe. 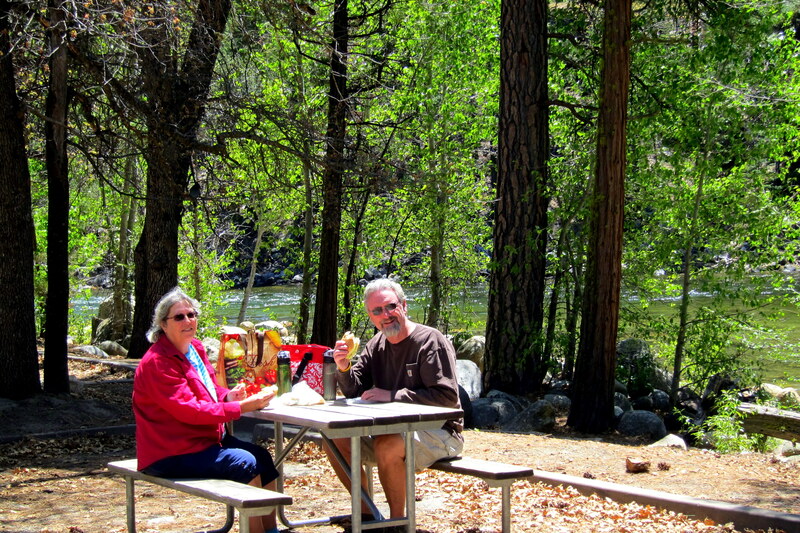 The third day at NAS Lemoore, Kit and I headed out to Kings Canyon National Park. 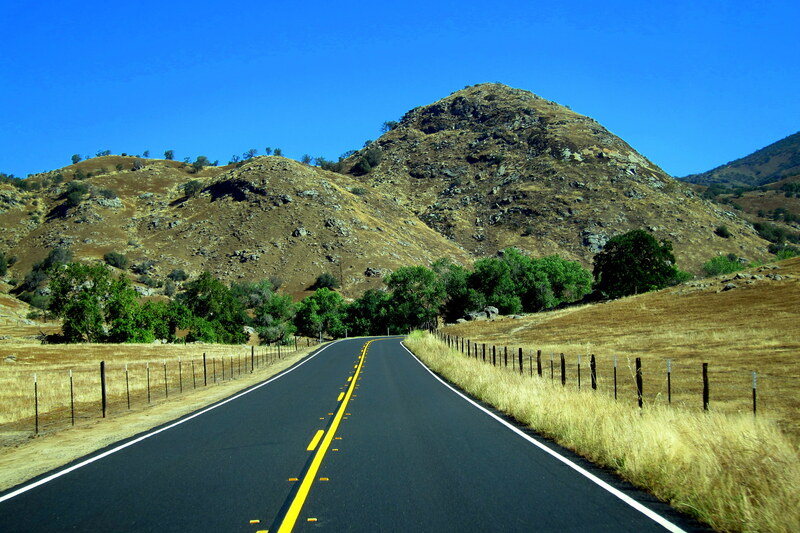 In order to see different countryside, we choose CA-63 and then CA-180 which led us to the park’s western entrance. At one of the many turnouts on the steep drive back into the mountains, we stopped to take in the incredible views. 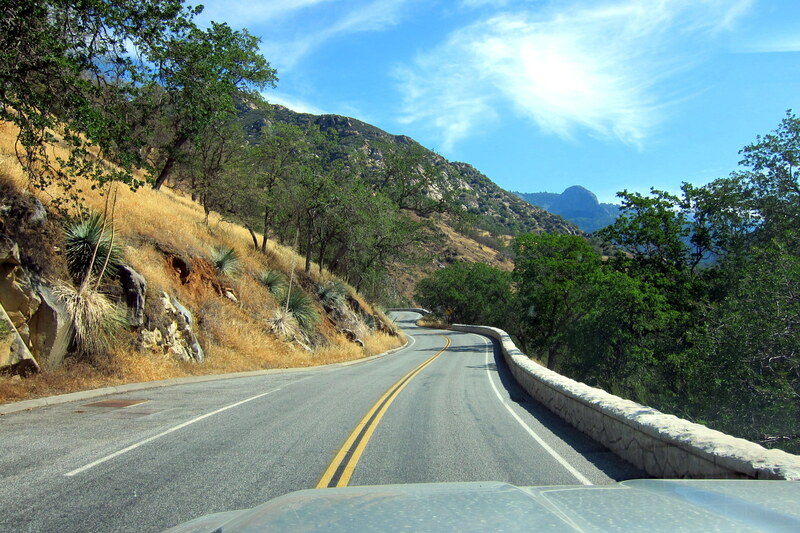 And in about an hour, we were rolling through the entrance gate to Kings Canyon National Park. 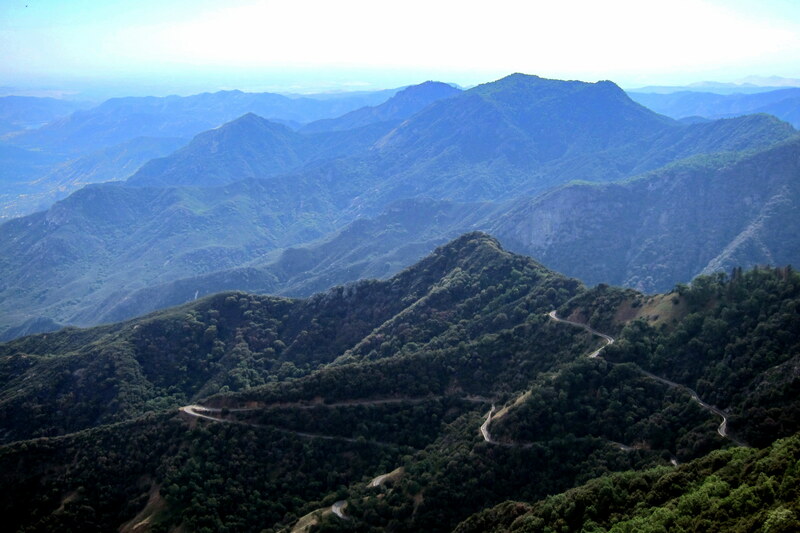 Where we continued to climb into the Sierra Nevada Mountains before dropping into the canyon itself. Approaching the canyon floor, Kit and I encountered the South Fork of the Kings River which was rushing full of High Sierra snowmelt. Since we were getting hungry, this seemed like a perfect spot to enjoy the picnic lunch that Kit had made earlier in the morning. There are no other cars around, but we had company anyway. 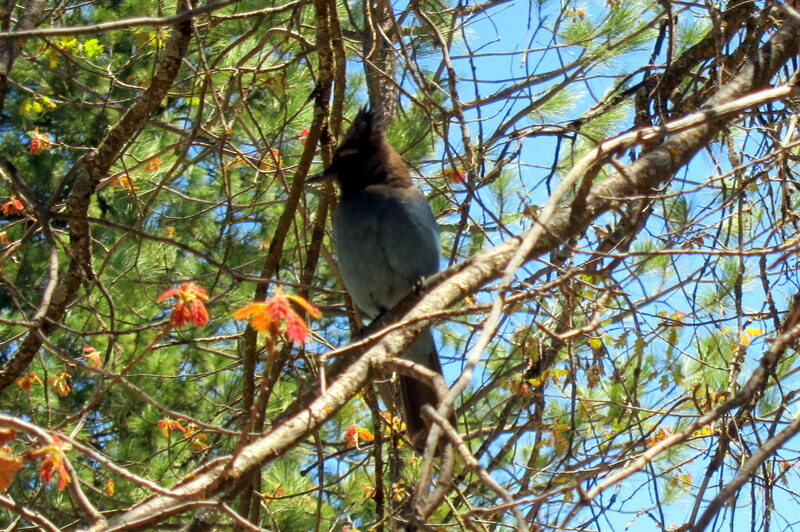 That guy is a Stellar Jay, and kept eyeing my sandwich. But being a good steward of native wildlife, I didn’t succumb to the urge and feed him…..much to his irritation. 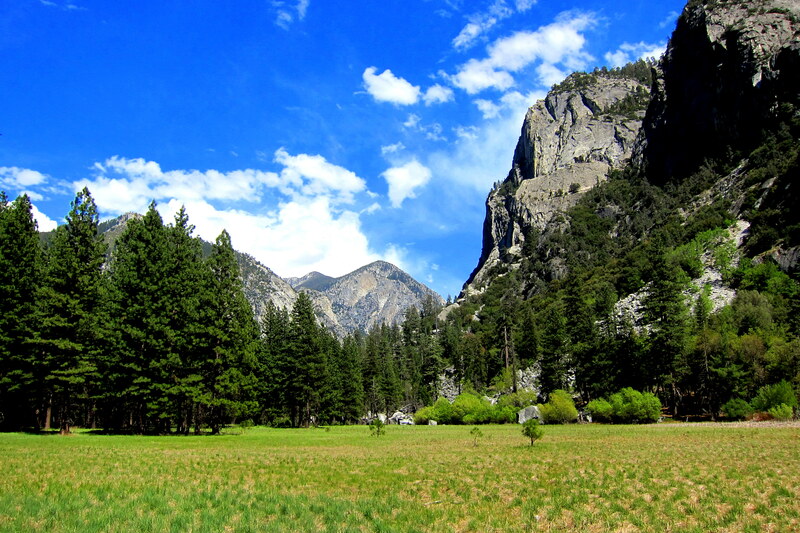 After lunch, we took a walk around the canyon floor and enjoyed yet another incredible meadow ringed with magnificent trees. A few hours of relaxation in this incredibly beautiful valley and Kit and I were ready to head home. Winding our way up and over the mountains we retraced our route back to the camper. Monday, May 4, 2015: We are up and on the road by 1030 for points north. 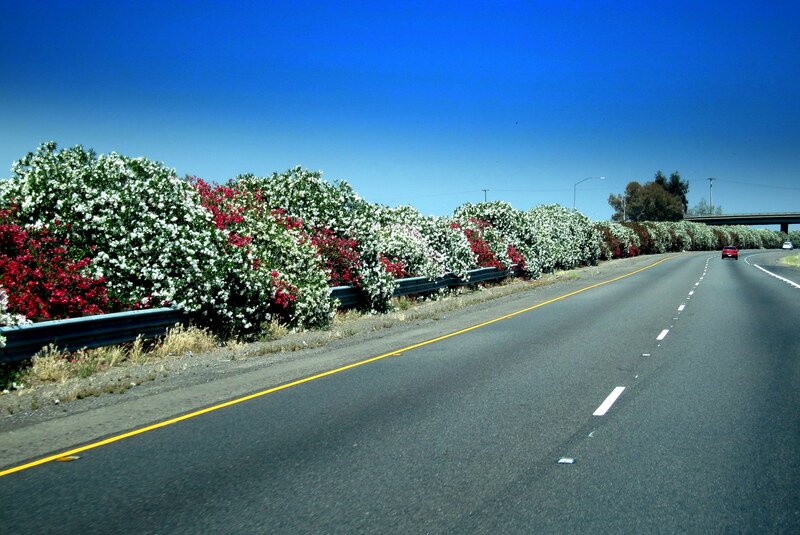 Hopping on CA-41, Kit and I made tracks for Fresno as we enjoyed the roadside Oleander in full bloom! 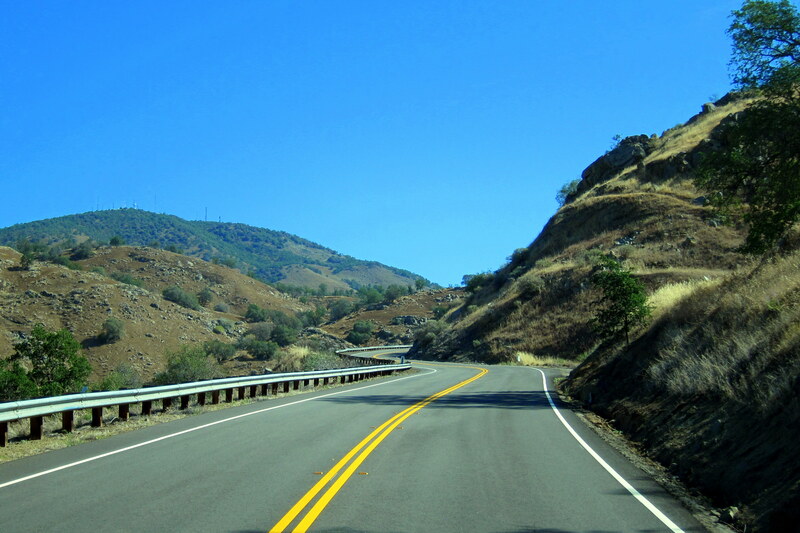 Within the hour, we moved over to CA-41, then CA-99 toward Merced, where we headed east on CA-140. At about 1330 we stopped for lunch at a nice community park in Catheys Valley. Notice that nice Live Oak tree in the foreground? That lovely tree will have a bit more significance later in the trip! 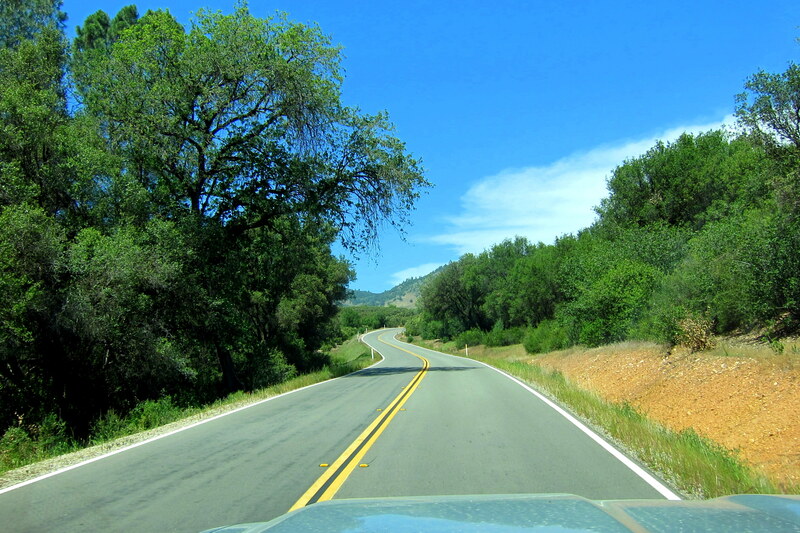 Back on the road, we rolled through the quaint little town of Mariposa. 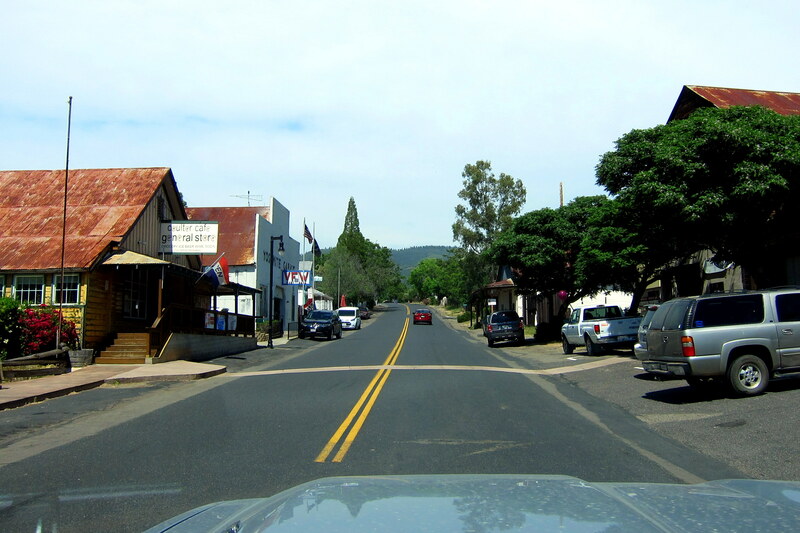 And headed north on CA-49, traveling through many small towns that had sprung up a hundred years ago along the life supporting railroad lines. 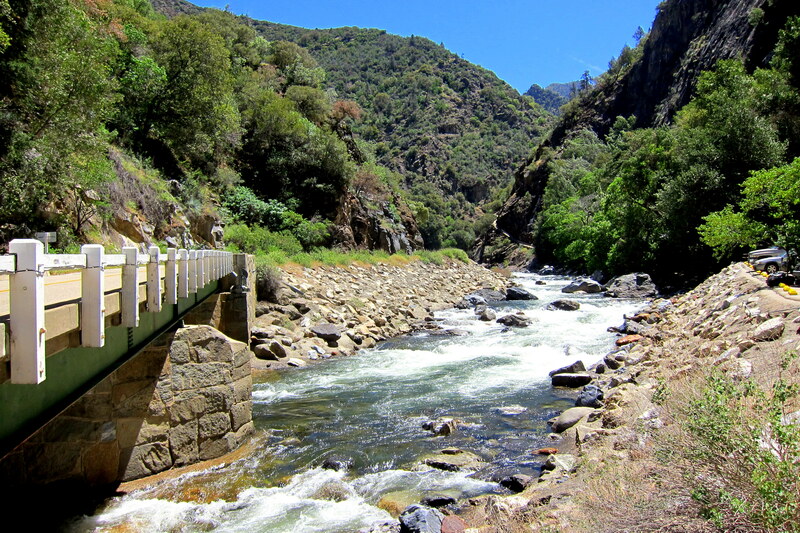 As we made our way northeast we began to climb into the foothills of the Sierra Nevada Mountain Range crossing the Merced River. 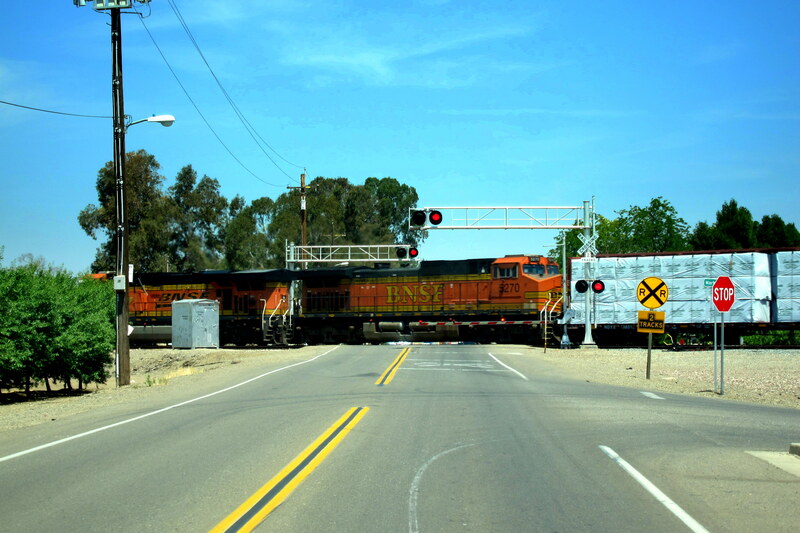 Intersecting CA-120, Kit and I meandered through the backroads toward the village of Groveland, California and our stop for the day. 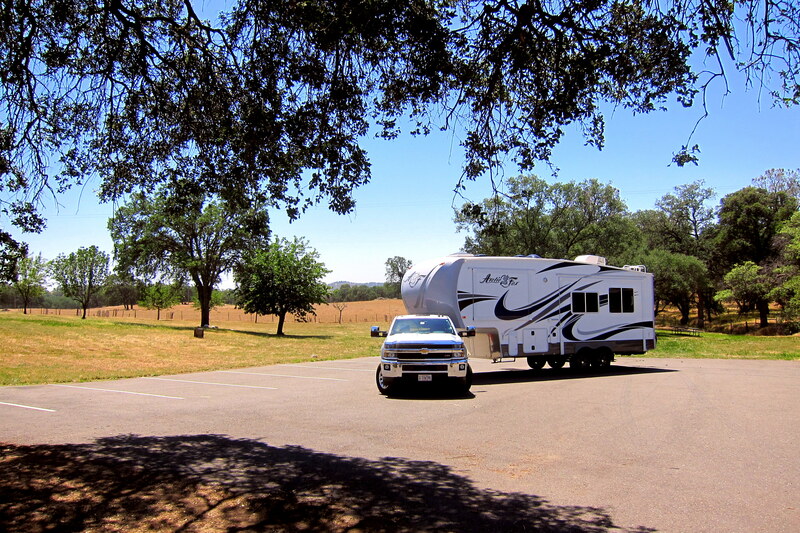 Registering at Yosemite Lakes RV Park, we decided to stay three nights in order for us to explore another National Park in the Sierra Nevada Mountain range. Can you guess which one? Stay tuned! Kit’s Bit’s: All of these neat parks we’ve heard of for years, since we were kids. And, it’s taken this many years for us to finally see them! The parks are so beautiful! Sometimes, as we’re coming down around the mountains though, I have to admit, I have to keep my eyes closed. It’s a bit hairy looking down a bazillion feet on the side of a mountain, especially where there are no guardrails. 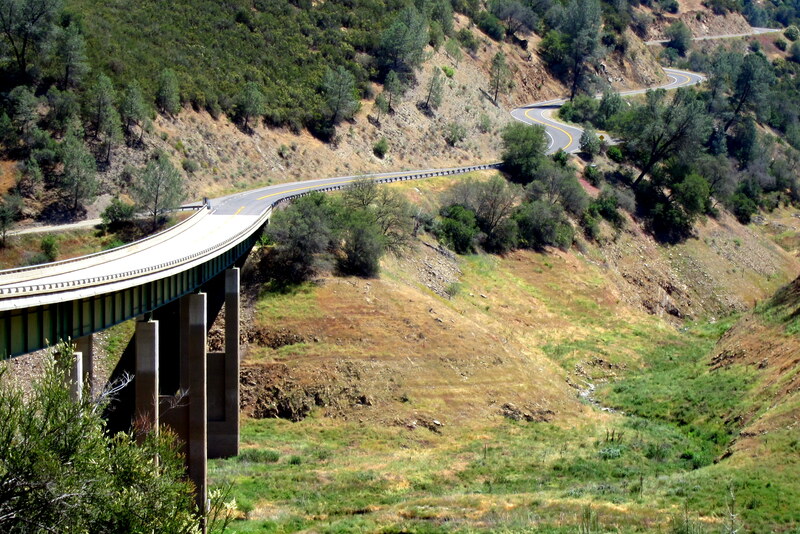 Fortunately, Bill handles all these hairpin turns and winding roads very well. Me, it takes a little time to “unwind” at the bottom of the hill. I still enjoy the adventure, though! 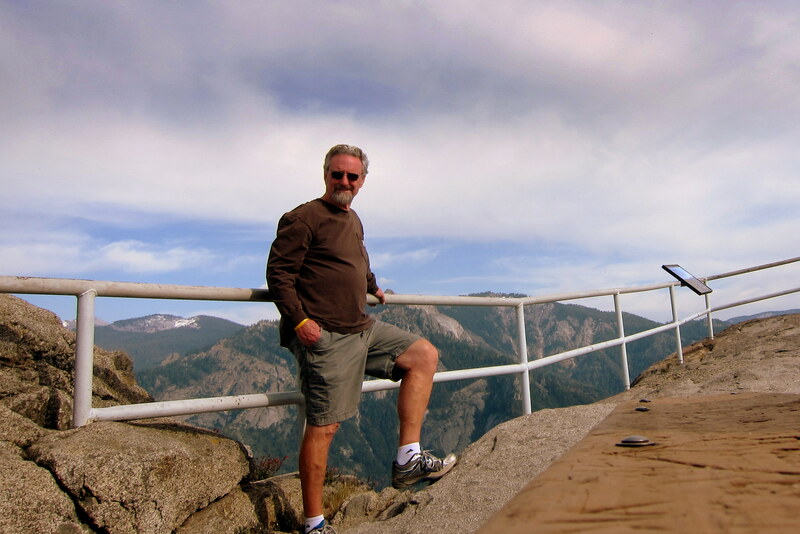 Thanks for sparking memories of a trip a few years ago to Sequoia and Kings Canyon National Parks. By the way, Spring has finally sprung in Brunswick, Maine. You’re welcome Jym. We are inbound and hope to be back in the neighborhood by the end of the month. 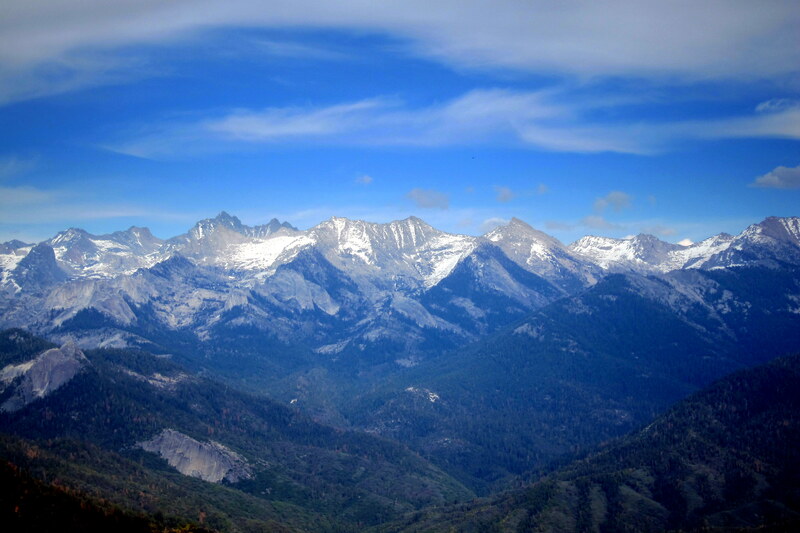 Some years ago, in my 40’s, I worked in both Sequoia and Kings Canyon. The museum you visited used to be three things…the bar, where that beautiful fireplace is…the market was the middle part, and the gift shop was the other end. My first summer, I worked in the gift shop. One night, I was closing up and had arranged a trio of wooden coyotes in the corner. Now, I had the only key as my boss was down the mountain for a few days. I was the one who opened in the morning. That trio of coyotes that I had lovingly arranged in the corner were now lined up across the doorway, as if they were stopping anyone from entering. True story! I ended up working there for two years. All the buildings…the hotel, cabins and the dorm where we lived, we’re all removed in the late 90’s to protect the trees. While I remember where all the buildings sat, they did an excellent job removing any trace of the old buildings. The only reason the museum building still stands is that it was over 50 years old and protected by law. I love Sequoia and Kings Canyon. Almost feels like going home when I am there. So happy you got to see both! Thank you so very much for the comment and sharing your personal stories about the area. There is nothing like first hand accounts of the way things used to be, and the wood coyote story is priceless. WHAT SCENERY AND I’M SURPRISED AT HOW FEW WERE IN THE PARKS. I ALWAYS ENVISIONED THE PARKS AS WALL TO WALL TOURIST. THE DRIED UP MERCED RIVER I SUSPECT IS A RESULT OF LACK OF RAIN IN CALIFORNIA?? SUMMER IS FAST APPROACHING, THE STATE IS LOADED WITH TOURIST ENJOYING THE MEMORIAL DAY WEEKEND. IT’S ALSO A DANGEROUS TIME TO HAVE LOADS OF TOURIST HERE AS THE FIRE DANGER IS IN THE RED ZONE. THANKS FOR THE GREAT TOUR OF SEQUOIA AND THE CANYONS, JUST SPECTACULAR. Hi folks, thanks for leaving the comment on our website. The National Parks we visited had a fair amount of tourist in them but nothing like at the height of summer…..the shoulder seasons are the best time to visit! The Merced did have water flowing which isn’t evident in the photo, however the flow was greatly reduced due to the draught. Take care, hope to see you soon! Awesome views! 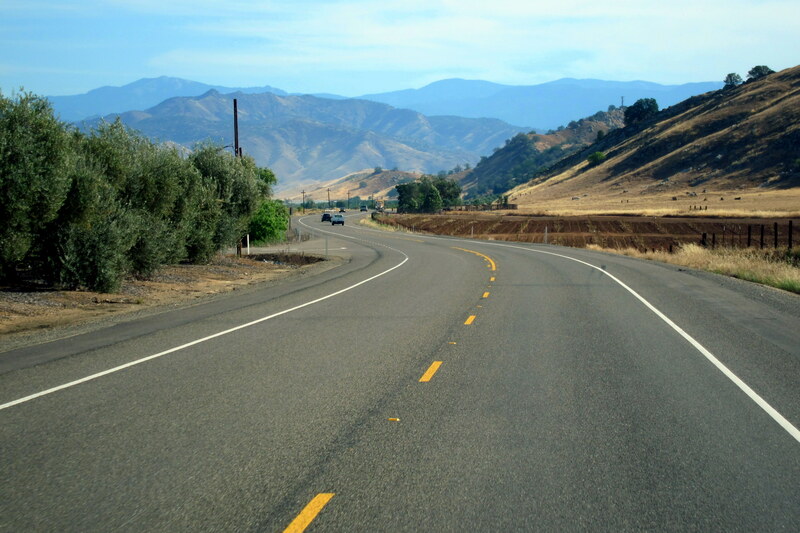 I wondered if you are impacted by the CA drought as you travel through the state? I wonder if a Sequoia would grow in Brunswick? I’m going to plant one and see! You should have taken a picture of Mom hugging one of the giant trees so she could be a tree hugger! Funny…..wish I had thought of that! A Sequoia seed is tiny, about the size of an oatmeal flake. Imagine one of those things growing in our backyard!?!? It would drive the neighbors crazy! Thanks for the nice comment concerning our offering. We throughly enjoyed visiting with you folks. Enjoy that new camper! Awesome! You guys are exploring my backyard (well, relatively speaking…) and are enjoying some of my favorite places. Next time you’re in SEKI you’ll have to meander a bit along one of the trails for a mile or two and enjoy what awaits you. Also, be sure to check out one of the two cave tours. There is so much history out there! Can’t wait to see how you fare in Y*******! Hi Jay, thanks for leaving a comment on the website. 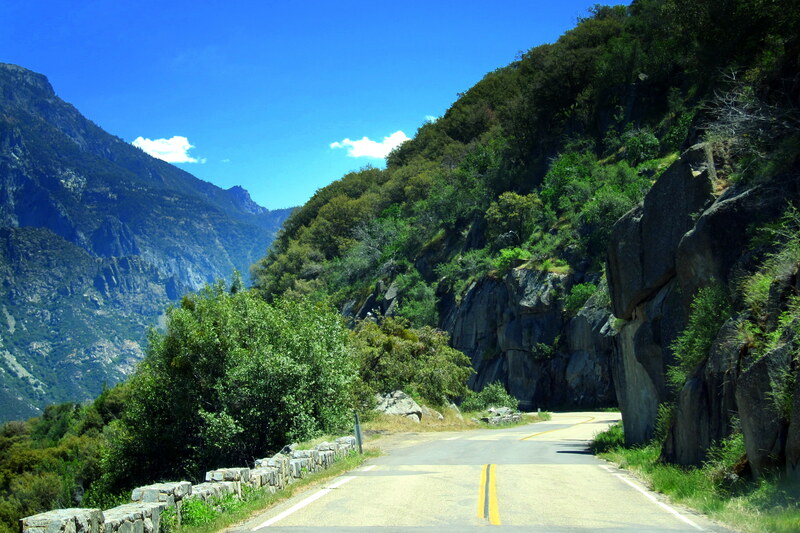 We throughly enjoyed the three National Parks we visited in the Sierra Nevada mountains. Take care, please tell the SD LM folks we are well. Wow! 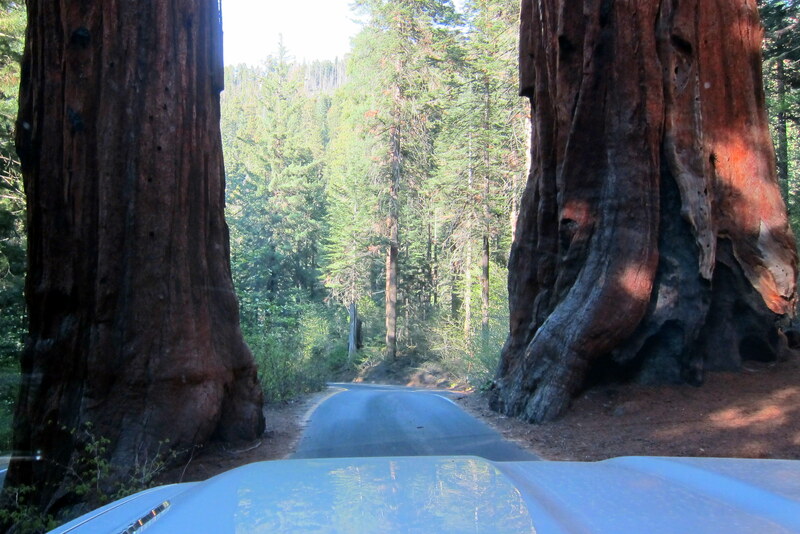 No matter how many pictures I see of giant Sequoias I never fail to be amazed at just how giant they really are! And the scenery so spectacular! Also love seeing all the oleander in bloom along the road. BTW, I guess you couldn’t get a picture of the actual nickel in the guy’s pocket, huh? Noted that the sign was carved in1931 but the nickel was minted in 1936.😊 Can’t wait to hear how the live oak figures in your journey! Love ❤ and miss you as I sit here watching my Baltimore orioles (the colorful ones that fly). Hi folks, thanks for leaving a comment on our website. We are very slowly meandering our way home…..hope to see you soon! Love you! !